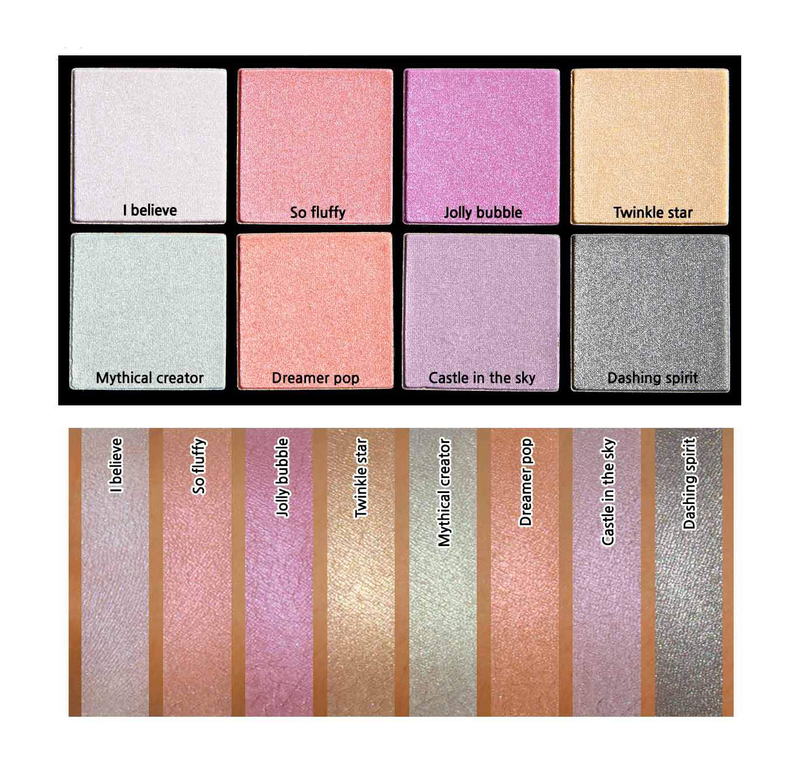 Unicorn Magic Glow Palette: I believe, So fluffy, Jolly bubble, Twinkle star, Mythical creator, Dreamer pop, Castle in the sky, and Dashing spirit. 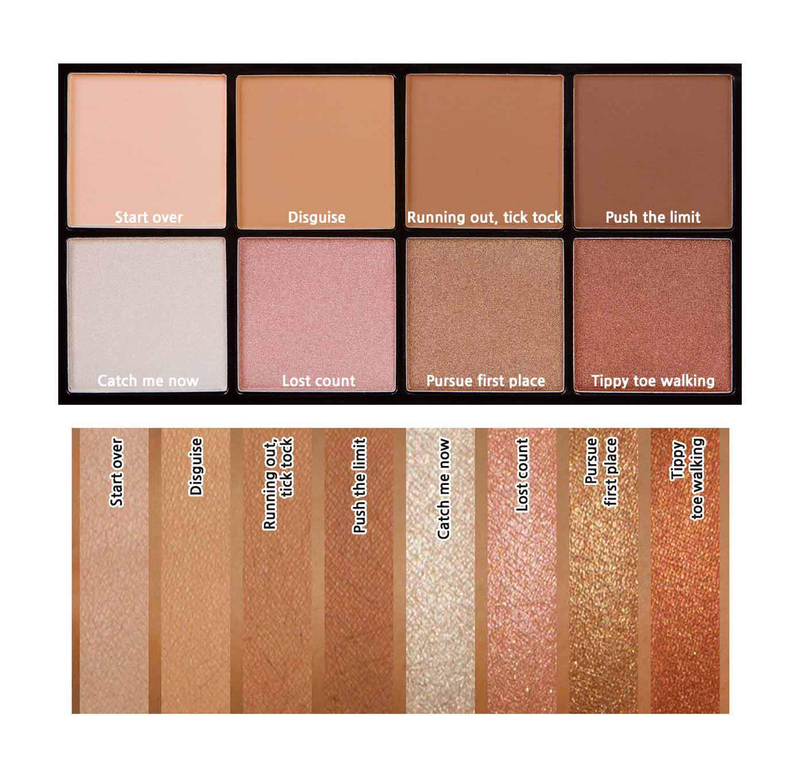 Hide & Seek Contour/Highlight Palette: Start over, Disguise, Running out – tick tock, Push the limit, Catch me now, Lost count, Pursue first place, Tippy toe walking. Mica, Talc, Magnesium Stearate, Mineral Oil (Paraffinum Liquidum), Dimethicone, Ethylhexyl Palmitate, Polyisobutene, Phenoxyethanol, Caprylyl Glycol, Ethylhexylglycerin. May Contain (+/-): Iron Oxide (CI 77491), Iron Oxide (CI 77492), Iron Oxide (CI 77499), Manganese Violet (CI 77742), (F)D&C Red No. 40 AI Lake (CI 16035), (F)D&C blue No. 1 AI Lake (CI 42090:2), Ultramarine (CI 77007), (F)D&C Yellow No.5 AI Lake (CI 19140:1), (F)D&C Red 28 AI Lake (CI 45410), (F)D&C Red No.7 Ca (CI 15850:1), (F)D&C Red 6 Ba Lake (CI 15850), Ferric Ferrocyanide (CI 77510), Titanium Dioxide (CI 77891), Carmine (CI 75470). Mica, Talc, Magnesium Stearate, Mineral Oil (Paraffinum Liquidum), Dimethicone, Ethylhexyl Palmitate, Polyisobutene, Phenoxyethanol, Caprylyl Glycol, Ethylhexylglycerin. May Contain (+/-): Iron Oxide (CI 77491), Iron Oxide (CI 77492), Iron Oxide (CI 77499), (F)D&C Red No. 40 AI Lake (CI 16035), (F)D&C Yellow No.5 AI Lake (CI 19140:1), (F)D&C Red 6 Ba Lake (CI 15850), Titanium Dioxide (CI 77891), Carmine (CI 75470).